Homemade Greek Salad Dressing is bold, zippy, and flavorful, made with simple ingredients you probably already have in your pantry! My very favorite thing to eat for lunch is a salad. I always keep romaine lettuce, tomatoes, and onions on hand and then throw in whatever else I've got in the fridge. I'll usually add some kind of cheese, some lunchmeat, or leftover chicken or steak. It really doesn't matter what you put in your salad though. Everyone knows it's all about the dressing. If I'm going creamy, I'm reaching for the Homemade Creamy Caesar. So cheesy and garlicky and amazing. If the mood strikes me to go for an oil and vinegar based dressing, I love a good Greek! 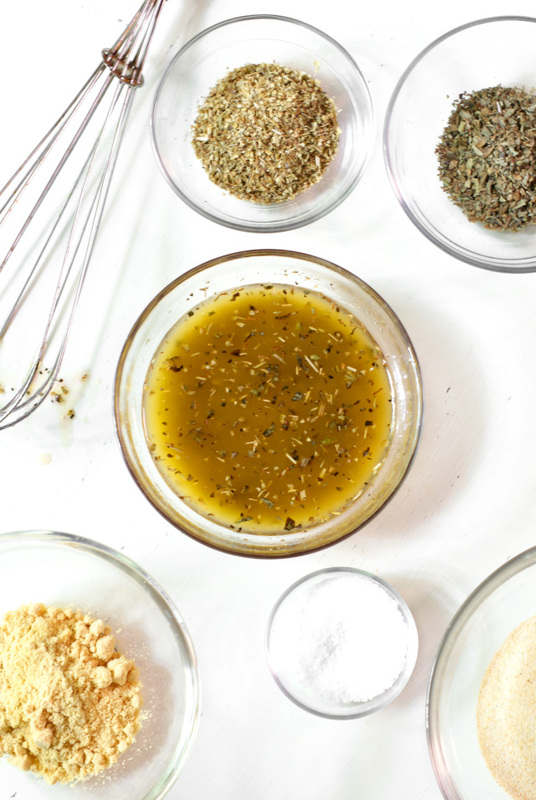 This Greek dressing recipe has the perfect combination of herbs and spices and is super easy to make. You'll love it! Whisk all of the ingredients together. Store at room temperature.